This is part of a local history note on the view from Richmond Hill. See the start of this local history note. One of the most well-known inhabitants of Richmond in the 18th century was Miss Susanna Houblon. When she died in 1765, she left her house and property on Richmond Hill – Ellerker House, now the Old Vicarage School – to her great-nephew with several conditions attached to the inheritance. Firstly, that her niece, Esther Mytton, should be allowed to live there undisturbed for as long as she chose to do so and, secondly, that no buildings should be erected or alterations made which might interfere with the "prospect from her windows." By the middle of the 18th century, therefore, the view from Richmond Hill had come to be regarded as something of a personal asset by those fortunate enough to live there. In the years which followed, however, Richmond residents began to realise that, thanks partly to the efforts of writers and artists such as those mentioned above, the famous prospect had become not only a personal and local asset but a national asset as well, and, as such needed to be carefully safeguarded. With this object in mind, the local authorities over the past two hundred years, have bought various properties and have taken over covenants whenever they have considered it necessary. The slopes which lead down to the river from the Terrace now contain the Terrace Gardens, one of the borough’s finest parks. The present Terrace Gardens originated from three large private estates: those of Buccleuch House, Lansdowne House and Cardigan House. Lansdowne House was demolished in about 1869 and its grounds were purchased by the 5th Duke of Buccleuch, who already owned a large villa on the riverside (Buccleuch House) with associated gardens on the Terrace. In 1886 the Richmond Vestry acquired the combines Lansdowne/Buccleuch estate and the Terrace Gardens were formally opened in May 1887 by the Duchess of Teck. Buccleuch House and its riverside gardens were in turn sold to Sir J. Whittaker Ellis (later to become Charter Mayor of Richmond). In 1936 the riverside area was purchased by Richmond Borough Council. Buccleuch House was demolished in 1938 and a promenade on the site was opened in the same year. The Cardigan House estate had been bought in 1925 by the British Legion and part of the grounds were acquired by Richmond Council in the following year. This area was not fully developed for many years, but in the late 1950’s work began on the creation of the woodland garden which was completed in 1962. 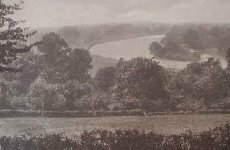 In 1896 the Trustees of the Earl of Dysart leased Petersham Meadows to the Corporation with the object of preserving the view from the Terrace. Subsequently, under the Richmond, Petersham and Ham Open Spaces Act 1902, which preserved the view, Petersham Meadows and Common were vested in the Corporation as public recreation grounds and open spaces. "That while the Committee think it desirable that the Island should be acquired for the Corporation if it could be obtained at a reasonable price, they are of the opinion that in view of the sum now named, it would be useless to enter into any negotiation for its purchase." In August 1898, Glover decided to auction the island and again, with the threat of a sale to a large advertising firm who would probably use the site as an advertising station, offered it to the Corporation for £4,000. Although the Corporation wanted to buy it, it felt that there was no justification in spending such a large sum of money out of its funds. There then followed a lengthy debate and correspondence in the local press about preserving the view from Richmond Hill and suggestions were made that the purchase should be funded jointly by public subscription and the corporation. By September, only £50 had been given to the public fund and the disclosure that Glover had purchased the island in 1872 for £70 did not helped the collection. The auction took place on 21st September when the highest bid was £200. It was noted that an unnamed resident had offered Glover £1,000 for the island which he then intended to present to the Corporation, but Glover refused to sell and also withdrew the island from sale. In 1900 Max Waechter, who lived in Terrace House, Richmond Hill, bought Glover’s Island and gave it to the Council – the sale price was never disclosed – and the island reverted to its original name of Petersham Ait. In 1902, Waechter also gave the freehold of Petersham Lodge and grounds as free gifts to the council for further preservation of the view. Sir J. Whittaker Ellis wrote to several national newspapers about the possible loss of several large houses and their grounds. He appealed to the Government, London County Council and municipal authorities to stop the destruction. Again there followed a long and heated debate in the newspapers. In June 1901, the view again was under threat, especially on the Middlesex side. Marble Hill House, a Palladian villa built between 1723 and 1729, and its park was in danger of being bought by developers. The estate was purchased by funds provided by various local authorities and private sources and, in 1903, was opened as a public park under the control of the London County Council; this became the Greater London Authority in 1965 and the house and park are now administered by English Heritage. In 1927 Mrs Nellie Ionides purchased Orleans House, the adjacent property to Marble Hill, to preserve it from industrial use. A Deed of Covenant was entered into by Richmond Borough Council, Twickenham Borough Council and Surrey, Middlesex and London County Councils in 1930. The terms of the deed were designed as far as possible to preserve the view from Richmond Hill by restricting the future development of the land to certain limited areas only. Compensation was paid to the then owners of the land for granting the right to enforce these restrictions. A speculative building firm (St. Alban’s Investments Ltd.) put forward, in 1958, a plan to build a series of lock-up garages in the Haversham Grange grounds in Cambridge Park, East Twickenham and applied for the modification of the restrictive covenants to enable them to carry out this work. The application was opposed by both the Richmond and Twickenham Borough Councils, together with other local authorities and private individuals. The case went before the Lands Tribunal who decided not to revoke the covenants and the firm was ordered to pay the agreed costs of each objector who was legally represented. Another dispute of recent years occurred in 1964 when a certain building concern applied for planning permission to erect a hotel of ‘skyscraper’ proportions on the site of the existing Star and Garter Hotel (below Richmond Terrace). The Richmond Society – a voluntary, but influential local amenity organisation – presented a petition to the Minister of Housing and Local Government objecting to the application and the project was subsequently dropped.